We are in equal walking distance, about 10 minutes, from both Leidseplein and Rembrandtplein. The Rijksmuseum is also a ten-minute walk, as is The Hermitage. 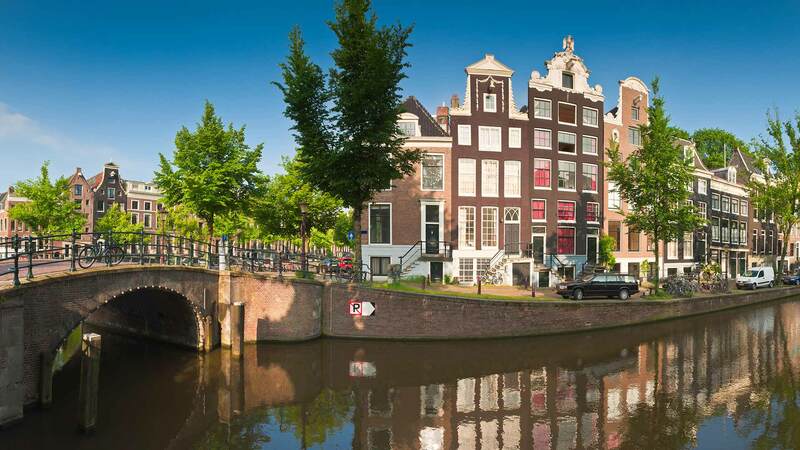 The main shopping streets of Kalverstraat and Leidesestraat, the flower market, the gay Reguliersdwarsstraat, and the 100-year-old Albert Cuyp market are also all within a comfortable 10 minutes walking distance. We are on the newest metro line 52 that connects the south and the north of Amsterdam right through the centre of the city in a few minutes. Amsterdam Zuid railway station is where the metro connects to the trains from Schiphol Airport, from there it takes you to the main exhibition centre, the RAI and on to our stop Vijzelgracht. The metro also stops at Amsterdam Central Station. Just a few doors away in Noorderstraat, we have a great local steak house, Piet de Leeuw (in business for over 60 years). Around the corner are an Italian delicatessen, and a Mediterranean style restaurant, Panini. Over the bridge on Prinsengracht is a Bagels coffee café, Village Bagels, and next door another local restaurant, De Fles. A bit further on Prinsengracht you’ll find Buffet van Odette. A real treat for which a reservation will be required as it is so popular. Our best kept secret restaurant is Harmsen, run by chef Olav Harmsen, in Utrechtsestraat. Here also, please make a reservation or ask us to do so for you. We appear to have been very bad at keeping this secret. All these are within a couple of minutes walk. We can highly recommend all of the above as we have personally tested them (and more than once). We also provide more restaurant tips in both the local area and other areas of Amsterdam for our guests. Also just around the corner is one of Amsterdam’s local institutions, Patisserie Holtkamp, one of the finest cake shops in The Netherlands. They make delicious biscuits, and meringues as well as delicious cakes. We are situated in a unique location for access to all forms of culture – museums, theatres, concert and opera venues, nightlife, comedy venues, and markets. We are close to De Pijp, a local area of Amsterdam which has the famous Albert Cuyp market, the Heineken Brewery museum and many excellent local restaurants, bars and clubs based around small squares and local streets. The theatres Carré, DeLaMar, Stadsschouwburg, and Boom Chicago are all close by and the Concertgebouw, one of the finest concert halls in the world is a 15 to 20 minute walk or a short tram ride. The Opera House is also within 20 minutes distance albeit in the other direction. We are just in between everything. The antique shopping street Spiegelstraat with its shops and galleries is a 5 minute walk away as is the Utrechtsestraat with its upmarket small shops, the only remaining and excellent old fashioned record store for virtually all kinds of music, Concerto, and specialised bookstores, and great cafes and restaurants (Harmsen being one of them).